He said he was too busy at the present to work out the details of the society but wanted Goudy’s response. What Goudy thought of the idea is unknown as no return letter has survived. But, whatever he thought, Dwiggins’ idea was still-born. 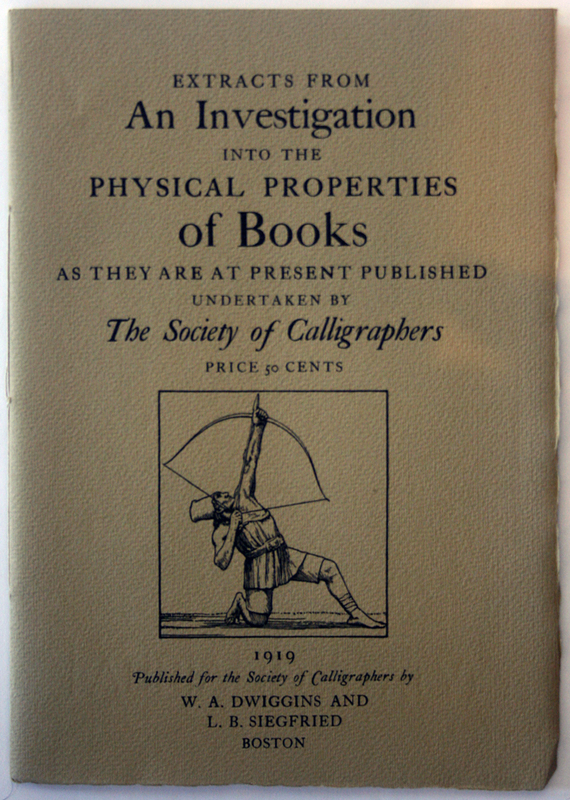 Cover of Extracts from An Investigation into the Physical Properties of Books as They Are at Present Published (Boston: W.A. Dwiggins and L.B. Siegfried for the Society of Calligraphers, 1919). Design by W.A. Dwiggins. Twelve years later, though, the Society of Calligraphers spectacularly emerged with the publication of a pamphlet entitled Extracts from An Investigation into the Physical Properties of Books as They Are at Present Published Undertaken by The Society of Calligraphers (Boston: W.A. Dwiggins and L.B. Siegfried for the Society of Calligraphers, 1919). This new Society of Calligraphers was very different from the one Dwiggins had envisioned in his letter to Goudy. It was a fictitious successor to the fictitious firm of Thedam Püterschein’s Sons that he and Siegfried had created in 1913 as a front for his non-commercial activities. As such it existed in name only. There were no members, only a President (Hermann Püterschein) and a Secretary (W.A. Dwiggins). The Society of Calligraphers was not a group of individuals devoted to the pursuit of calligraphy, but a vehicle for Dwiggins to promote himself, his work and his ideas. Several years after Extracts from an Investigation the Society published two Bulletins of Transactions of the Society of Calligraphers (No. 1, in two parts, on January 1, 1924 and No. 2 on February 3, 1925), both with texts attributed to H. Püterschein. The first focused on Püterschein’s (Dwiggins’) ideas on illustrating books while the second recorded Dwiggins’ efforts to create a new method of making ornaments. Like Extracts from an Investigation, the Bulletins were intended to get the attention of publishers in the hopes that they would commission Dwiggins to design books. While Extracts seemed to have failed in this mission, it seems that the Bulletins succeeded as Dwiggins’ career as a book designer essentially began a year later with designs for Nobodaddy by Archibald MacLeish (Cambridge: Dunster House, 1926), Streets in the Moon by MacLeish (Boston: Houghton Mifflin Co., 1926) and My Mortal Enemy by Willa Cather (New York: Alfred A. Knopf, 1926). He illustrated the latter. Bulletin No. 2 of the Transactions of The Society of Calligraphers (February 3, 1925). Design by W.A. Dwiggins. Title page of Paraphs by Hermann Püterschein (New York: Alfred A. Knopf, 1928). Design by W.A. Dwiggins. The Society seemed to fade away after Paraphs came out, though Püterschein continued to exist. It had achieved its goal. 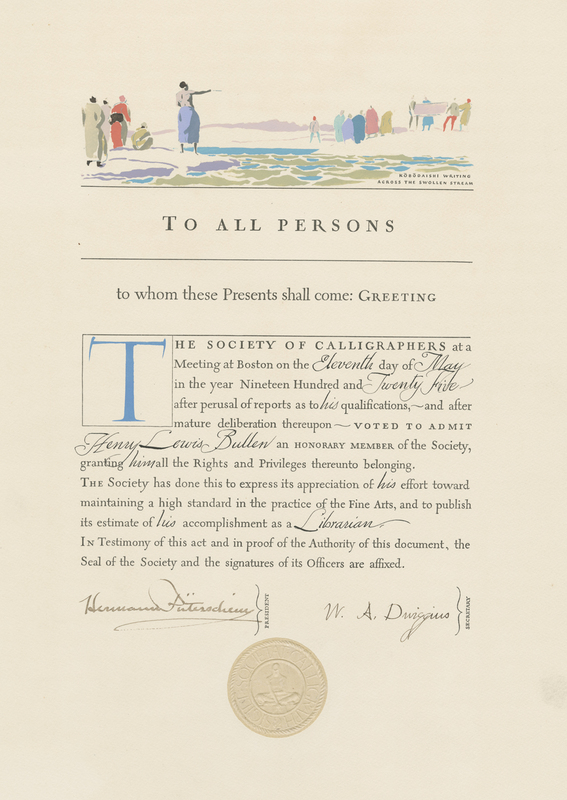 Society of Calligraphers certificate of Honorary Membership for Henry Lewis Bullen (1925). Design, illustration and calligraphy by W.A. Dwiggins. Letter from W.A. 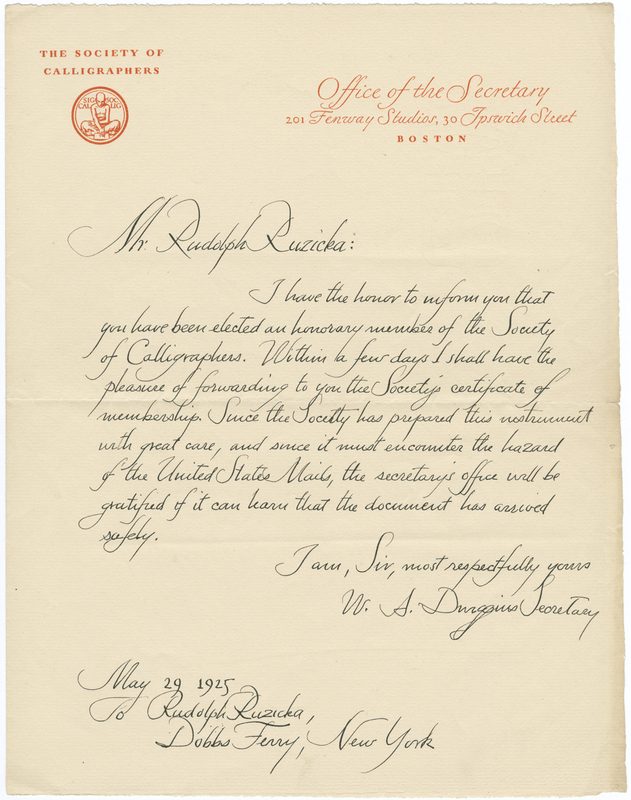 Dwiggins to Rudolph Ruzicka (29 May 1925) regarding honorary membership in the Society of Calligraphers. Courtesy of the Rauner Library, Dartmouth College. Articles and List of Honorary Members of the Society of Calligraphers (1925). Design and calligraphy by W.A. Dwiggins. Article XVI explained the criteria—distinguished “accomplishment in the Arts”—for being chosen as an honorary member of the Society and the obligations and privileges of such membership, most notably exemption “from the payment of an entrance fee, and from all dues.”  The criteria for honorary membership was simple and deliberately broad in order to explain the inclusion of the diverse men (and one woman) chosen. Given that the Society of Calligraphers was not devoted to calligraphy it is not surprising that the list of honorary members included only a few of the accomplished calligraphers, letterers and type designers of the time. Among the missing Americans were Fred G. Cooper, Harvey Hopkins Dunn, T.B. Hapgood, Walt Harris, Adrian Iorio, Walter Dorwin Teague, and George Trenholm; and prominent among the missing Europeans were Edward Johnston, Eric Gill, and Rudolf Koch. These men were left out because the honorary members were chosen to serve Dwiggins’ own ends. 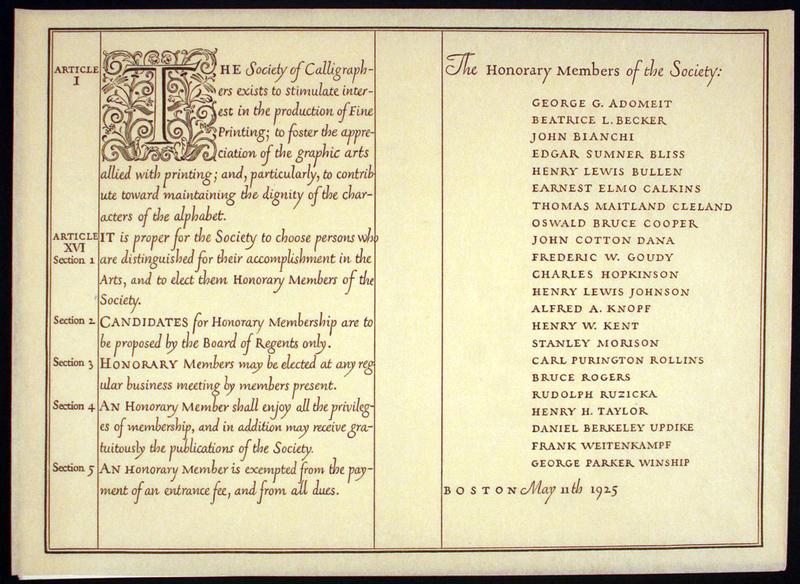 The creation of honorary members of the Society of Calligraphers served two purposes for Dwiggins. First, it strengthened the notion that the Society was real, even if many of those honored knew otherwise. And second, it furthered his self-promotional efforts. Thus, the list included book publishers, printers, book designers, advertising men, illustrators, and librarians as well as lettering artists and type designers. Their names are not well known today other than one or two, but each one was carefully considered by Dwiggins. Here is a run-down of the honorary members in alphabetical order as set forth on Dwiggins’ broadside. Title page of Attitudes, vol. 3, no. 1 (1927) by The Caxton Company. Decorative stencil design by W.A. Dwiggins. Courtesy of the Western Reserve Historical Society. John Bianchi (1874–1957) oversaw the daily operations of The Merrymount Press. Since 1915 he had been a partner of Daniel Berkeley Updike, the press’ founder. Dwiggins did an immense amount of work for The Merrymount Press between 1906 and 1932, some of it commissioned by Bianchi. Edgar Sumner Bliss (1867–1941) was the president of the Worthy Paper Co. from 1896 to his retirement in 1930. He was described as having “probably contributed more to the development of fine papers than any other man in the history of American paper-making.”  Dwiggins had done work for Bliss and the Worthy Paper Co. three months before the honorary members were anointed. Thomas Maitland Cleland (1880–1964) was a magazine art director, book designer, illustrator, and advertising designer. When he was art director of McClure’s Magazine he hired Dwiggins to do several illustration and decoration jobs. The two men knew each other through doing work for Daniel Berkeley Updike and The Merrymount Press who, unbeknownst to them, often pitted them against each other for jobs. Dwiggins designed the keepsake for Cleland’s talk on Bodoni to the Society of Printers in 1913. The two men were never close friends, but Dwiggins respected Cleland and his various talents as designer, illustrator, decorative artist, and calligrapher. Certainly Cleland’s role in the design and production of A Grammar of Color would have cemented his place as an honorary member of the Society of Calligraphers. The Marchbanks Calendar November 1924. Design by T.M. Cleland. Courtesy of the Thomas Fisher Rare Book Library, University of Toronto. Cleland designed all twelve monthly mailings of the calendar. Each displays his abilities as an illustrator, ornamentalist, calligrapher and colorist. Oswald Bruce Cooper (1879–1940) was a classmate of Dwiggins at the Frank Holme School of Illustration in Chicago. In conjunction with John Reed, another classmate, they established The Ridge Shop, a very short-lived private press. Although Dwiggins and Cooper were only rarely in touch with each other after 1902, they remained good friends. Cooper was arguably the most talented lettering artist of his generation and thus well qualified to be an honorary member of the Society of Calligraphers. 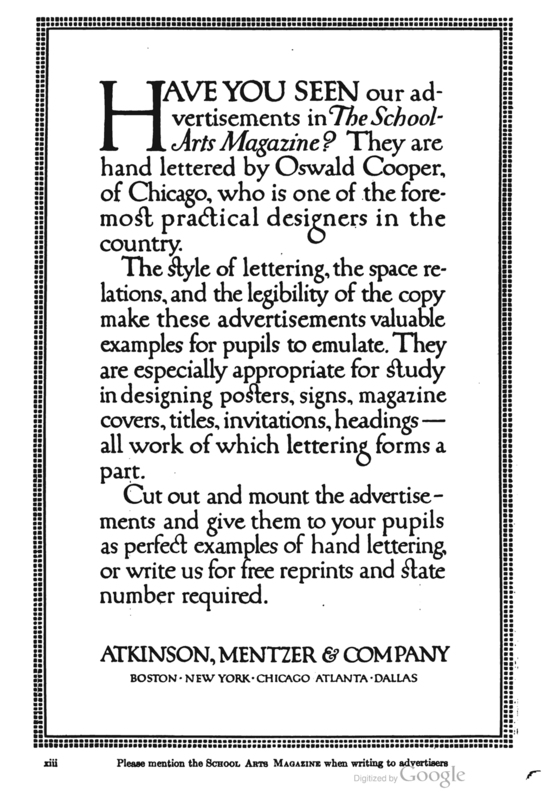 Advertisement for Atkinson, Mentzer & Company in The School Arts Magazine (1913). Entirely handlettered by Oswald Cooper. Frederic W. Goudy (1865–1947) was the most important of Dwiggins’ teachers at the Frank Holme School of Illustration in Chicago. He taught lettering and ornament, two skills that became essential elements in Dwiggins’ arsenal as a commercial artist. Although primarily known as a type designer today, Goudy was equally renowned for his lettering skills in the early 20th century. As indicated at the beginning of this post, Dwiggins’ initial idea for a Society of Calligraphers was first broached to Goudy. 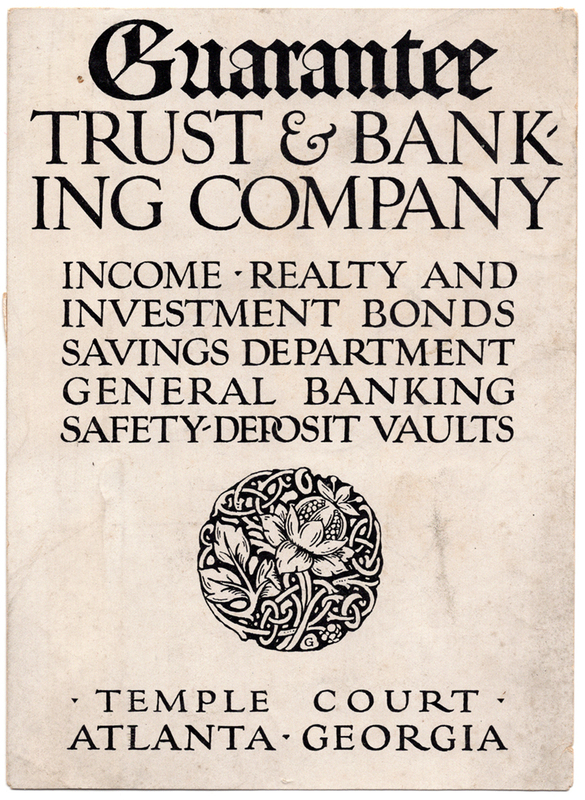 Cover of Guarantee Trust & Banking Company brochure (n.d.). Design, ornament and lettering by Frederic W. Goudy. 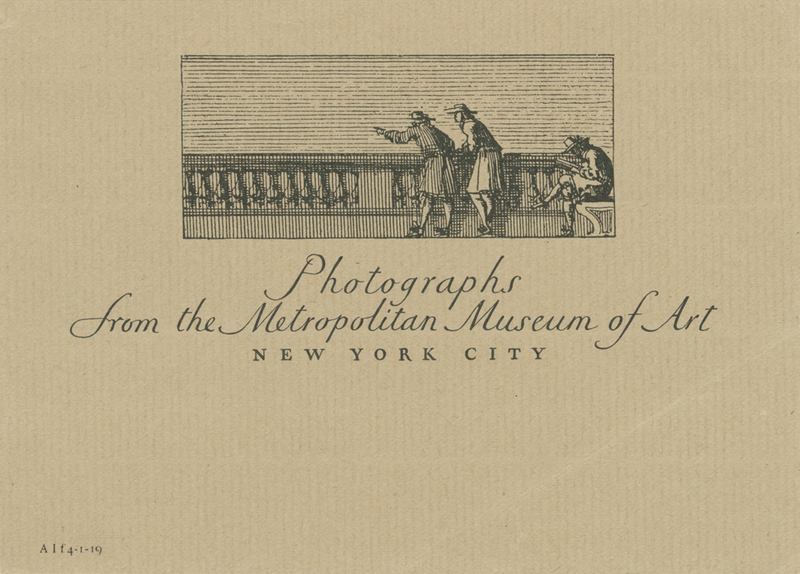 Shipping label for the Metropolitan Museum of Art (1918). Illustration and lettering by W.A. Dwiggins. Title page of Ralph Herne by W.H. Hudson (New York: Alfred A. Knopf, 1923). Book design by Bruce Rogers. Note his initials and thistle mark composed of fleurons. Stanley Morison (1889–1967) was the typographic advisor to the Monotype Corporation, a cofounder of the Fleuron Society and its journal The Fleuron, and the author of Four Centuries of Fine Printing (1924) at the time Dwiggins anointed him an honorary member of the Society of Calligraphers. Although he was only at the beginning of his long and illustrious career, these activities and accomplishments alone made him eminently qualified to be so honored. Furthermore, Morison had a deep and long-lasting interest in the history of calligraphy. From a personal standpoint, he had prevailed the year before upon Dwiggins to write an account of The Merrymount Press for the third volume of The Fleuron. Morison was the only non-American among the honorary members which, in itself, was a rare honor. Despite that, years later, he was very critical of Dwiggins’ typefaces. I am cuckoo about that Dürer book. If I start in to tell you how much I like it I shall get mawkish. It hits me in a tender spot, somehow. If I had known what it was like I should have scrambled over to Dunster House to get one. The circular didn’t give me any idea! You got there a quality that I have been keen to get lately: a quality that I can only define by the word ‘warmth,’ and that doesn’t mean anything except to me. Some printing has blood flowin around it in its veins, and some doesn’t. 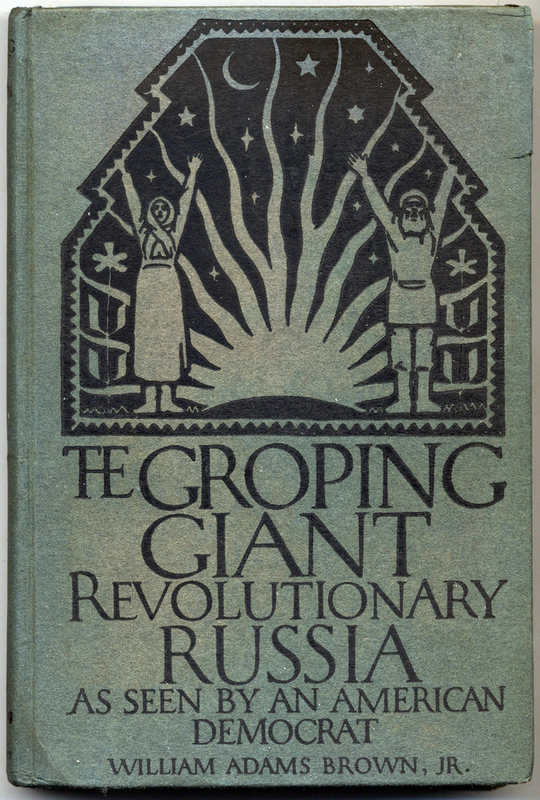 The Groping Giant: Revolutionary Russia as Seen by an American Diplomat by William Adams Brown, Jr. (New Haven: Yale University Press, 1920). Cover design by W.A. Dwiggins; interior design by Carl Purington Rollins; printing by E. Hildreth and Company. Rudolph Ruzicka (1883–1978) was best known in the early 1920s for his prowess as an illustrator and wood engraver. He and Dwiggins first met in 1911 when both were doing work for Daniel Berkeley Updike and The Merrymount Press and became instant friends. In the early 1920s, Ruzicka was one of Dwiggins’ closest confidantes, along with Carl Purington Rollins. Ruzicka was talented as a letterer and in later years it was Dwiggins who convinced him to become a type designer. 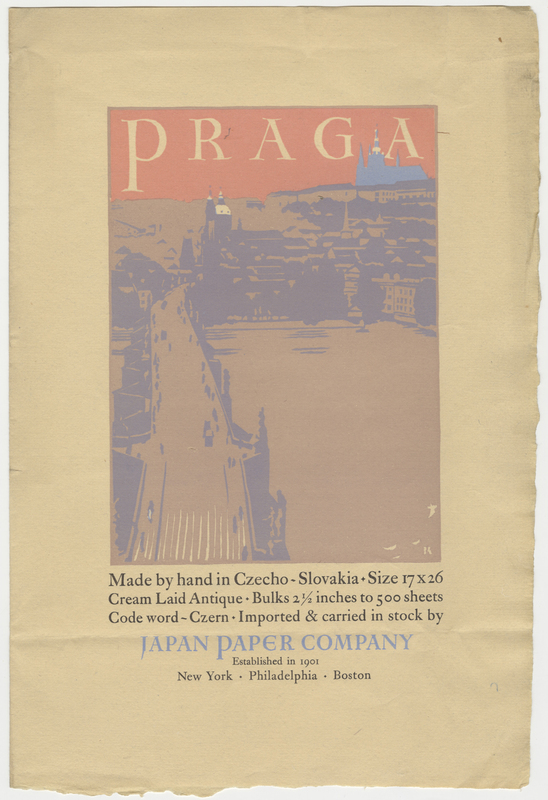 Praga paper specimen for Japan Paper Co. (c.1922). Woodcut illustration and lettering by Rudolph Ruzicka. Henry H. Taylor (1879–1937) was a partner, with his brother Edward DeWitt Taylor, in the San Francisco printing firm of Taylor & Taylor. In 1920 the company captured the attention of the printing world in the East when it won silver medals for catalogue and stationery design in the exhibition of printing organized by the American Institute of Graphic Arts. Henry H. Taylor had taken a leave from the printing firm in 1912 to attend the Graduate School of Business Administration course in Printing and Publishing at Harvard University where he met Dwiggins who taught a second year class. 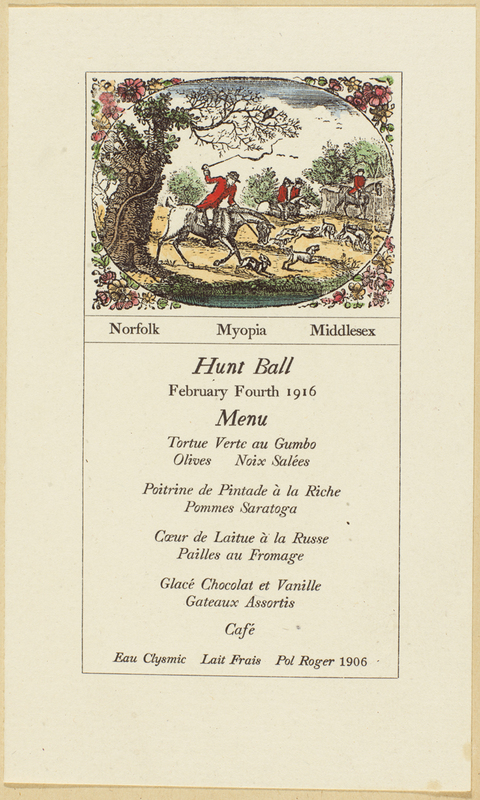 Invitation for the 1916 Hunt Ball sponsored by the Norfolk Hunt Club. Printed by The Merrymount Press; handcolored by W.A. Dwiggins. Courtesy of the Huntington Library. Others seemed to simply take delight in getting an example of work by Dr. Püterschein. 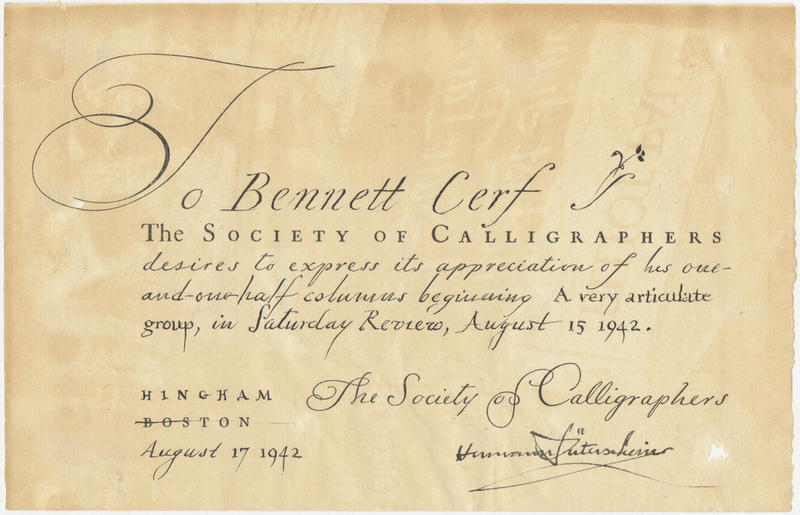 Society of Calligraphers appreciation card to Bennett Cerf (August 17, 1942). Courtesy of Rare Book and Manuscript Library, Columbia University. To insure that the Society of Calligraphers would be taken seriously Dwiggins designed a letterhead (shown above as letter to Rudolph Ruzicka), half-sheet, envelope, mailing label, and seal for it. He also created an appreciation card (see directly above), possibly in response to Gress’ politicking. In 1927 the letterhead was reproduced in dark green as part of the Model Letterheads Printed on Certificate Bond portfolio produced by the Crocker-McElwain Company. The envelope is notable for its exuberant paraph below “Society of Calligraphers”—and its rose color. In contrast, the mailing seal is black on acid green. With these designs for the Society of Calligraphers, Dwiggins was beginning to explore wild and unusual colors, something which would come to characterize his work during the second half of his career. 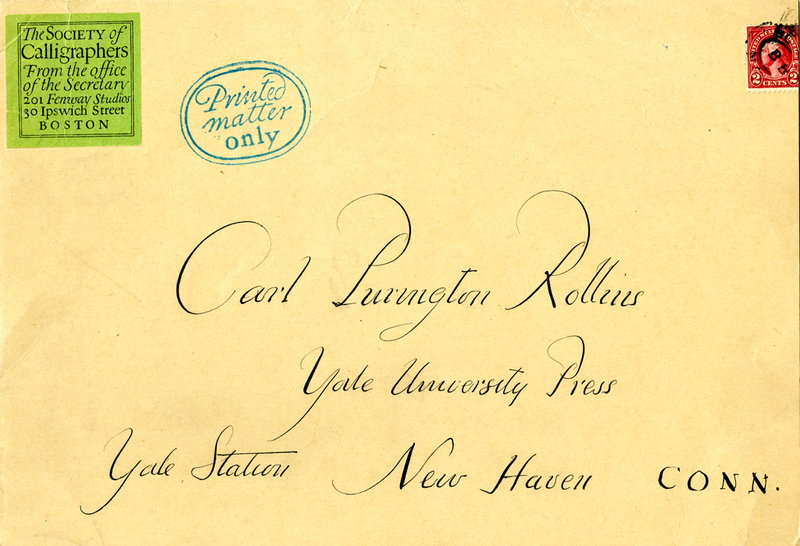 Society of Calligraphers envelope addressed to Carl Purington Rollins (1925). Design and calligraphy by W.A. Dwiggins (c.1923). Courtesy Robert B. Haas Family Arts Library, Yale University. 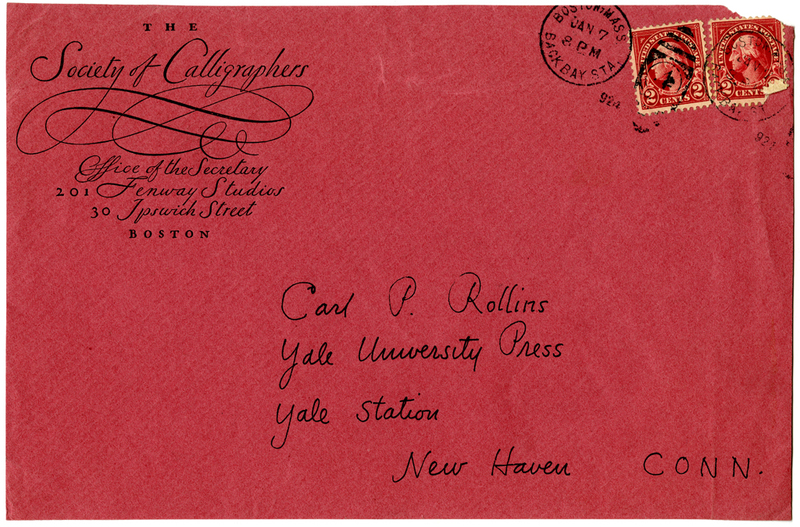 Envelope addressed to Carl Purington Rollins with Society of Calligraphers mailing label. Label designed by W.A. Dwiggins (c.1922). Courtesy of the Robert B. Haas Family Arts Library, Yale University. The Society of Calligraphers served Dwiggins in several capacities. It was an opportunity to create designs free of commercial pressures or interference. It was a vehicle for his writings, both fictional and professional; and his experiments in book design, illustration and ornamentation. And it was a means of promoting himself without being pushy or succumbing to puffery. Thus, it is not surprising that the Society went into hibernation after the publication of Paraphs in 1928. By that time, Dwiggins had successfully begun his transition from the world of advertising to that of book design and no longer had need of the Society’s help. 1. For the full chronology of calligraphic societies between 1900 and 2000 see A Chronology of the Lettering Arts from 1850 to 2000: A Work in Progress by Paul Shaw (Alphabet vol. 25, no. 3 [Spring 2000] and Scripsit vol. 24, nos. 1 & 2 [Summer 2000]). For a current list of such groups see the website of the Friends of Calligraphy. 2. W.A. Dwiggins to Frederic W. Goudy, 10 September 1907 in Folder 31, Box 9, 2001 W.A. Dwiggins Collection, Boston Public Library. 3. Years later, Siegfried told Paul A. Bennett of The Typophiles explained his role in the pamphlet’s creation: “The text had been almost completed at the time I got out of the navy at the end of June, 1919, and I was quite surprised and very much delighted to find that my name had been included on the MS title page. The reason Bill included it probably was that the Society of Calligraphers was a sort of spiritual successor to, or anyhow an offshoot of, the firm of Thedam Püterschein’s Sons and, to that extent anyhow, was a continuation of the prewar publishing activities in which we had been jointly implicated. I had a hand in editing, proofreading, seeing the book through the press (it was printed by Lincoln & Smith, Boston), and in shaping the final conclusion regarding the study of advertising; otherwise the project, finances included, was entirely Bill’s.” See Laurance B. Siegfried to Paul A. Bennett, 17 October 1944 in Folder 493, Box 16, 2001 W.A. Dwiggins Collection, Boston Public Library. 4. Dorothy Abbe, Dwiggins’ colleague late in his career and the force behind the creation of the Dwiggins Collection at the Boston Public Library, claimed that Dwiggins created the Society in order to have an audience for his personal activities. See her unpublished typescript biography of Dwiggins (1972), p. 20 in Folder 181, Box 31, WAD 2001. I believe that she underestimated the many ways that Dwiggins used the Society, as he did his alter ego Hermann Püterschein, to promote himself while avoiding the appearance of self-promotion. 5. See W.A. Dwiggins to Alfred A. Knopf, 8 November 1927 in Folder 132, Box 31, 2001 W.A. Dwiggins Collection, Boston Public Library. 6. 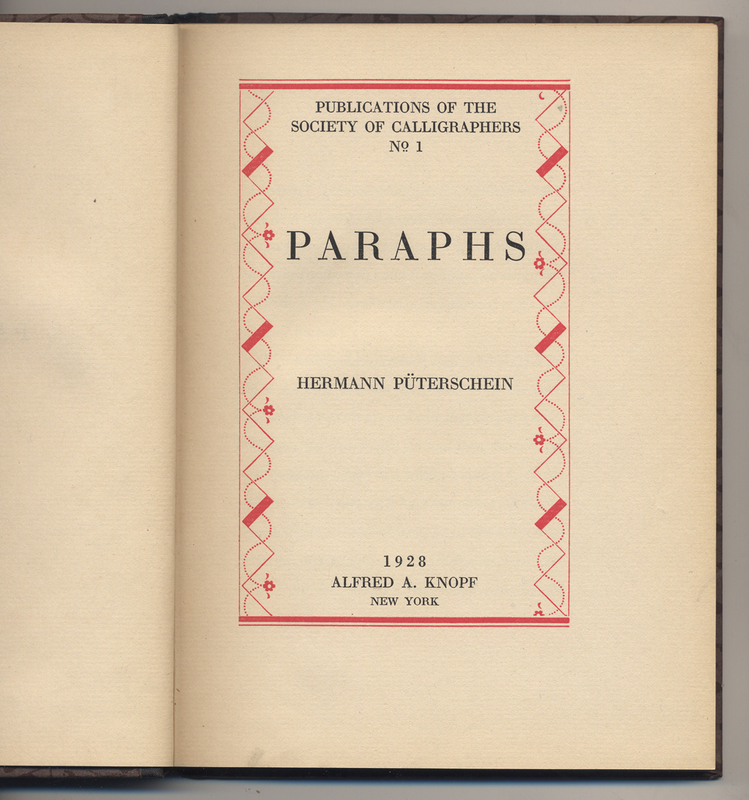 Paraphs, the only book in the Publications of the Society of Calligraphers series, was the last publication to bear the Society’s imprint. Around 1925 Dwiggins had explored an illustrated edition of the tales of Sinbad that never came to fruition. “Three Designs for / SINBAD / published by / The Society of Calligraphers” may have been intended as another Bulletin of the Transactions of the Society of Calligraphers. Illustrations for it exist in different states of completion in Box 8, 1974 W.A. Dwigggins Collection, Boston Public Library and Folder 31, Box 36, 2001 W.A. Dwiggins Collection, Boston Public Library. The last known use of the Society as a Dwiggins promotional vehicle is in the title that his friend Carl Purington Rollins gave for the typescript of his speech made at the opening of the Dwiggins exhibition sponsored by the American Institute of Graphic Arts: “Transactions of The Society of Calligraphers Supplementary Proceedings 17 November 1937.” See Folder 3, Box 33, 2001 W.A. Dwiggins Collection, Boston Public Library. 7. The woodcut and the artwork for the Society of Calligraphers seal is in Box 47, WAD 1974 W.A. Dwiggins Collection, Boston Public Library, while the mold for it is in Box 99 of the same collection. 8. Original drawings for the certificate along with printed copies are in Box 47, 1974 W.A. Dwiggins Collection, Boston Public Library, while Box 43 of the same collection has additional copies. A master stenciled copy, in a special portfolio box, is in Folder 11, Box 36, 2001 W.A. Dwiggins Collection, Boston Public Library. One of the BPL copies was originally given to Frederic W. Goudy. The only other known completed copy is the one for Henry Lewis Bullen in Box 25, Typographic (ATF) Collection, Rare Book and Manuscript Library, Columbia University. Two partial copies, one only of the stenciled illustration at the top and the other missing the portion below the initial T, are in two different collections at the Rochester Institute of Technology: Dwiggins Box No. 2, Melbert G. Cary Collection and the Paul Standard Papers. A different printed version with the text in cursive is in Box 35, Series VII, Carl Purington Rollins Papers, Robert B. Haas Family Arts Library, Yale University. Dated 15 July 1921 on its back, it indicates that Dwiggins had been planning to create the honorary members several years earlier. Also see the account book entry for 17–18 March 1920 marked “Calligraphers Certificate” in Folder 13, Box 81(2), 1974 W.A. Dwiggins Collection, Boston Public Library. 9. 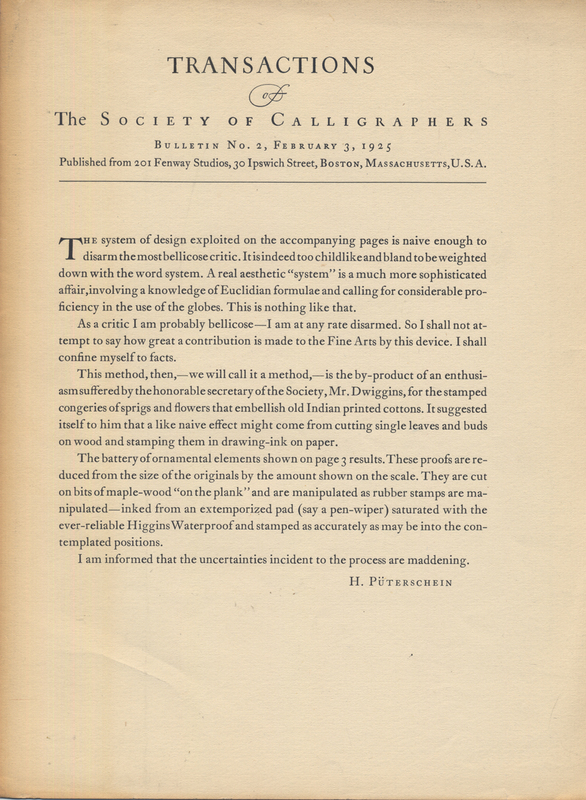 It is interesting that Dwiggins called his fictitious organization the Society of Calligraphers. Although “calligraphy” (meaning “beautiful writing”) is a commonly used term today, it was often avoided at the time in favor of “lettering,” which is both broader and less judgmental. In fact, Edward Johnston had deliberately labeled his seminal book Writing & Illuminating, & Lettering (London: John Hogg, 1906). I suspect Dwiggins chose “calligraphy” both for its general unfamiliarity as a word as well as for its implication of excellence. Both connotations are no longer applicable as the word is not only familiar today, but used to refer to many works that are neither beautiful nor examples of writing. 10. The wording is notable for referring to “graphic arts” rather than “graphic design.” In this Dwiggins followed the common practice of the day (e.g. the American Institute of Graphic Arts). For more about the misunderstanding of Dwiggins as the putative coiner of the phrase “graphic design” see my posts on the subject: June 4, 2014; June 8, 2014 and The Definitive Dwiggins no. 81. 11. This line was clearly included to assure the honorary members that there were no financial strings attached to the honor. There is no evidence that the articles between I and XVI ever existed. 12. Adomeit paid Dwiggins’ invoice for the Packard advertisement job in five days. Dwiggins’ account book entry includes this note: “Paid like a gentlehomme.” See the entry for 17 May 1918 in Dwiggins Account Books, Box 81(2), 1974 W.A. Dwiggins Collection, Boston Public Library. 13. Attitudes was first published in 1912. See The Inland Printer, vol. 50, no. 5 (February 1913), p. 713 for an early cover. 14. See Beatrice Becker to W.A. Dwiggins 1 February 1924 in the ATF Collection, Rare Book and Manuscript Library, Columbia University; and Beatrice Lamberton Becker to Daniel Berkeley Updike 25 September 1924 in the Paul Bennett Collection on Frederic Warde, Grolier Club. 15. Obituary in The Princeton Alumni Weekly, vol. XLII, no. 27 (May 1, 1942), p. 19. 16. See the entry for 19–20 February 1924 in Dwiggins’ account books, Box 81(2), 1974 W.A. Dwiggins Collection, Boston Public Library. 17. It is unclear from the entry whether the letterhead was for Calkins & Holden or possibly for Crane Paper Co. See 27 August 1923 and 13 September 1923, Dwiggins Account Books, Box 81(2), 1974 W.A. Dwiggins Collection, Boston Public Library. 18. Cleland did work for the S.S. McClure Co. from 1906 to November 1908. He became art director of McClure’s Magazine sometime before December 1907. As art director he commissioned Dwiggins in February 1908 to design decorative frames for four poems and a cover for The Under Groove by Arthur Stringer. One of the poem frames and the book cover design were rejected, replaced by designs by Cleland. For the poem frames see also T.M. Cleland to D.B. Updike 20 December 1907 in Folder 1907, Box 21, T.M. Cleland Papers MSS 16147, Manuscript Division, Library of Congress. For the Society of Printers Bodoni keepsake see the entry for 1 May 1913, Dwiggins Account Books, Box 81(2), 1974 W.A. Dwiggins Collection, Boston Public Library. The account books also contain entries for all of the McClure projects, both completed and rejected. 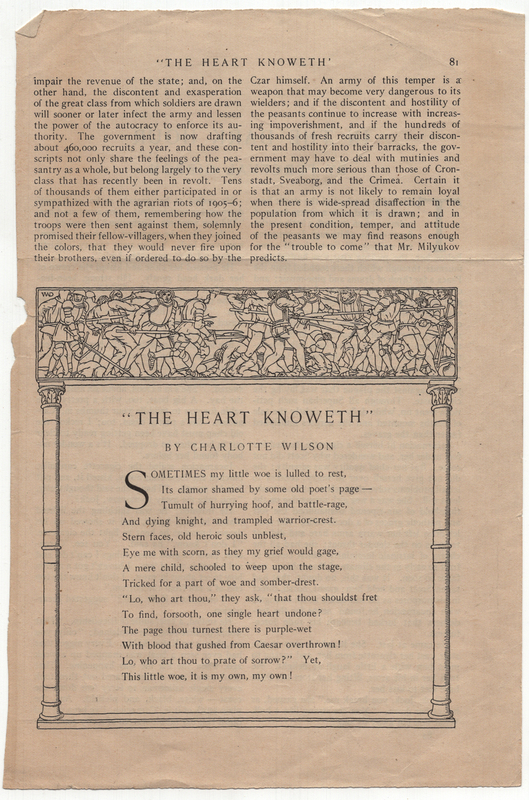 “The Heart Knoweth” by Charlotte Wilson from McClure’s Magazine (May 1908, p. 81). Decorative frame by W.A. Dwiggins. Boston Public Library, 1974 W.A. Dwiggins Collection, Box 41, Folder 33. 19. Although Dwiggins respected Cleland, he was still willing to poke fun at his design predilections and prejudices. See The Definitive Dwiggins no. 67—Drawings that Sell Goods. At some point in his career, Cleland adopted the cancellaresca corsiva as his hand for correspondence. 20. “I last saw Oz in Anno Domini 1902… We exchange notes—short, telegraphic in a way—every eleven years or so—or possibly seventeen. Exchange of views or news is not an essential part of an association of this kind. Each party knows [this party knows, at least] that the other is on the job night and day covering all the fronts, immediately available on call if needed.” From “Note on Oz” by W.A. Dwiggins in The Book of Oz: An Appreciation of Oswald Bruce Cooper edited by Raymond DaBoll (Chicago: Society of Typographic Arts, 1949), p. 46. 21. 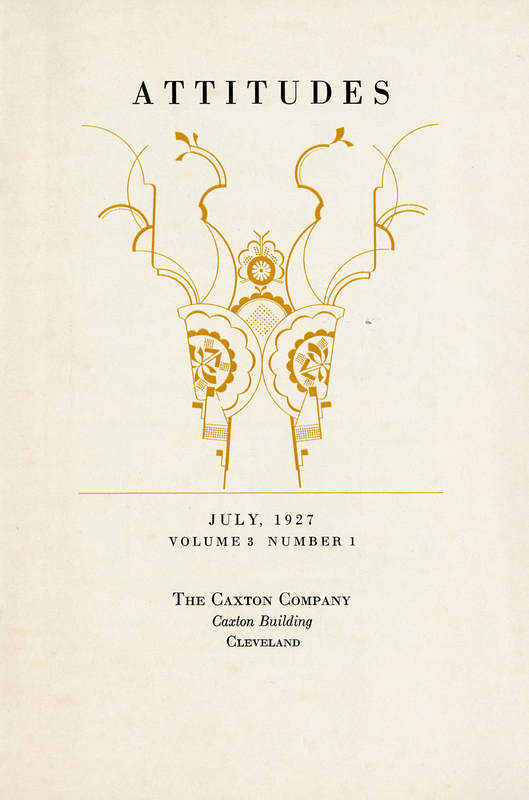 A copy of the brochure designed by Dwiggins describing the contest and its winners is in the Crocker-McElwain Folder, Richard C. Jenkinson Collection, Special Collections Division, Newark Public Library. The Jenkinson Collection also includes material that indicates Dana was on Dwiggins’ mailing list since 1919 for publications from the Society of Calligraphers. 22. For the latter see Folders 23, 24 and 29, Box 73, 1974 W.A. Dwiggins Collection, Boston Public Library. 23. The early commissions that Johnson gave Dwiggins were minor, such as a set of initials for The Graphic Arts in 1912, but Dwiggins’ ledgers also indicate some more substantive jobs such as the cover for an unspecified Sears Roebuck publication. See the entries for 20 November 1916 and 12 and 23 March 1917, Folder 5, Box 81(2), 1974 W.A. Dwiggins Collection, Boston Public Library. 24. Kent may be best known for having commissioned Bruce Rogers to design a set of titling capitals for the Museum Press which became the basis for his Centaur typeface. The full story can be found in The Noblest Roman: A History of the Centaur Types of Bruce Rogers by Jerry Kelly and Misha Beletsky (San Francisco: Book Club of California, 2016). 25. Kent first hired Dwiggins in 1911 to design the title lettering for the cover of The Metropolitan Museum of Art Arms and Armor. Other jobs for the Museum prior to 1925 included a shipping label for photographs and some certificates. For the Grolier Club Kent hired Dwiggins to design borders and letter signs. See the entries for 18 January 1911, 27 June 1918 and 15 October 1921 for the Museum jobs; and 24 and 26 November 1917, 4 December 1917, and 30 December 1919 for the Grolier Club jobs in the Dwiggins account books, Box 81(2), 1974 W.A. Dwiggins Collection, Boston Public Library. A month after Society of Calligraphers certificates were mailed out Kent hired Dwiggins to letter two tablets for Glebe House in Woodbury, Connecticut. 26. 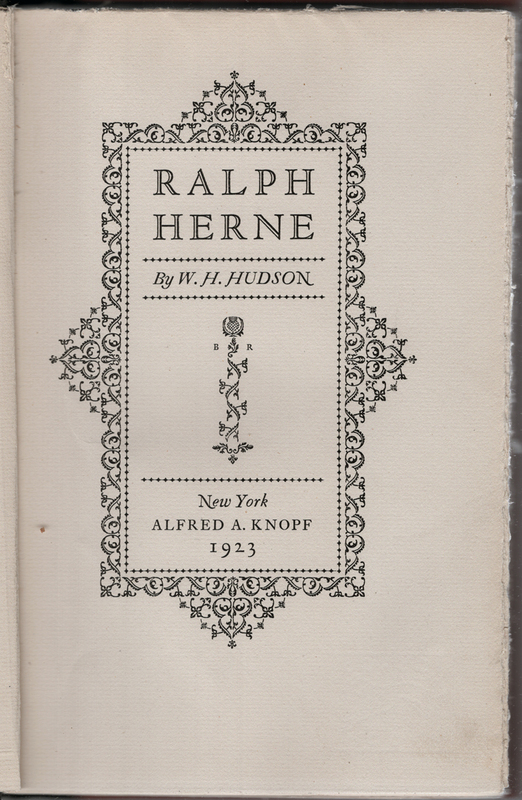 See the special edition of Ralph Herne by W.H. Hudson (New York: Alfred A. Knopf, 1923) designed by Bruce Rogers and the special edition of Ornaments in Jade by Arthur Machen (New York: Alfred A. Knopf, 1924) designed by T.M. Cleland. 27. In 1918 the two men were friendly rivals as Dwiggins was briefly art director of the Harvard University Press and Rollins was starting out at the Yale University Press. Dwiggins’ work for Rollins after 1918 was for Yale University as well as for Yale University Press, including a large map of the campus in 1920. 28. For the full story of the Püterschein/Dwiggins AIGA contretemps see Publishers’ Weekly (February 16, 1929), p. 775. Also see E.G. Gress to Carl Purington Rollins, 19 January 1929 in Box 2, Edmund G. Gress Papers, New York Public Library. 29. W.A. Dwiggins to Bruce Rogers, 3 March 1925 in Folder 5, Box 1, Pforzheimer Bruce Rogers Papers, Library of Congress. 30. Dwiggins’ letter referring to his first meeting with Ruzicka is undated, but, based on other correspondence, the meeting took place between May and November of 1911. W.A. Dwiggins to Daniel Berkeley Updike, n.d. File 461, Box 108, The Merrymount Press Collection, The Huntington Library. The correspondence between Ruzicka and Dwiggins was especially heavy in the early 1920s when Dwiggins was trying to shift his career from advertising work to book design and Ruzicka was also looking for new opportunities. See the Dwiggins Correspondence Folder, Box 1, Rudolph Ruzicka Collection UP-66, Rauner Special Collections Library, Dartmouth College. 31. Taylor & Taylor celebrated their Eastern success with the publication of The Work of Taylor & Taylor at the Exhibition of American Printing in New York City 1920 (San Francisco: Taylor & Taylor, 1921) which also garnered them national praise. 32. For a summary of the important and complicated relationship that Dwiggins had with Updike see “Dwiggins and Updike: Pupil and Mentor” by Paul Shaw in Parenthesis 27 (Autumn MMXIV). 33. Weitenkampf told Paul A. Bennett that he was astonished to have been elected an honorary member of the Society of Calligraphers. See Frank Weitenkampf to Paul A. Bennett, 27 July 1960 in Box 19, Folder 19, Paul A. Bennett Papers, New York Public Library. Also see note 38 below. Weitenkampf met Dwiggins in 1928 when both men served, along with Charles Dana Gibson, on the jury for the 3rd annual American Book Illustration competition sponsored by the American Institute of Graphic Arts. 34. See W.A. Dwiggins to George Parker Winship, 29 March 1912, John Carter Brown Library, Brown University. A few months later Bruce Rogers hired Dwiggins to letter Winship’s wedding certificate. See the entry for 19 June 1912, Folder 5, Box 81(2), 1974 W.A. Dwiggins Collection, Boston Public Library. 35. Dwiggins was in the midst of working with Marchbanks on the printer’s 1925 calendar when the honorary members were announced. He did two jobs with Munder in 1911 and one with Kittredge at the Franklin Printing Co. Dwiggins’ major project with Kittredge, the Lakeside Press edition of the Tales of Edgar Allan Poe, did not begin until 1926. 36. They are Adomeit, Becker, Bliss, Calkins, Cleland, Dana, Goudy, Hopkinson, Kent, Knopf, Morison, Rogers, Rollins, Taylor, and Weitenkampf. See Box 44 (1 and 20), 1974 W.A. Dwiggins Collection, Boston Public Library. For some reason Herbert Farrier, president of the Japan Paper Co., also sent a response. Did he receive a certificate of membership later? He certainly deserved one. 37. Daniel Berkeley Updike to W.A. Dwiggins, 26 December 1925, Box 44(1), 1974 W.A. Dwiggins Collection, Boston Public Library. Updike’s description of his handwriting as hard to read is entirely accurate. 38. The certificate referred to must have been Frank Weitenkampf’s. The New York Public Library, despite its name, is actually private. From “0.5 Irving Street: A Typographer and His Puppets [sic]” by Mary Elizabeth Prim in the Boston Evening Transcript 2 February 1935 Magazine Section, p. 3. 39. The American Printer, vol. 81, no. 6, (20 September 1925), p. 41. 40. The American Printer, vol. 81, no. 8 (October 20, 1925), p. ?? 41. Bennett Cerf Papers, Rare Book and Manuscript Library, Columbia University. Despite being dated 1942, the card was designed and printed in the early 1920s, possibly in response to Gress’ importuning. A blank copy is in the Carl Purington Rollins Papers, Box 35, Series VII, Carol Purington Rollins Papers, Robert B. Haas Family Arts Library, Yale University. 42. Folder 25, Box 9, 2001 W.A. Dwiggins Collection, Boston Public Library. The folder is labeled Society of Calligraphers Certificate to DA [Dorothy Abbe] but the pencil sketch is the only item in it. 43. For more on Abbe’s life see Strings Attached: Dorothy Abbe, Her Work and WAD by Anne C. Bromer (Boston: Boston Public Library and Society of Printers, 2001).